CELADA is honoured to support an upcoming presentation on the University of Ottawa Campus. 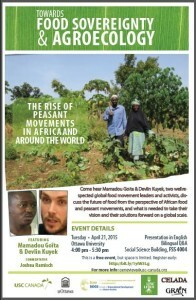 On Tuesday, April 21 at 4PM, please join us in learning more from Mamadou Goita (IRPAD) and Devlin Kuyek (GRAIN) who, with the help of Joshua Ramisch (UOttawa), will discuss the future of food from the perspective of African food and peasant movements. In an hour and a half they will explore and debate what is needed to take their vision and their solutions forward on a global scale. 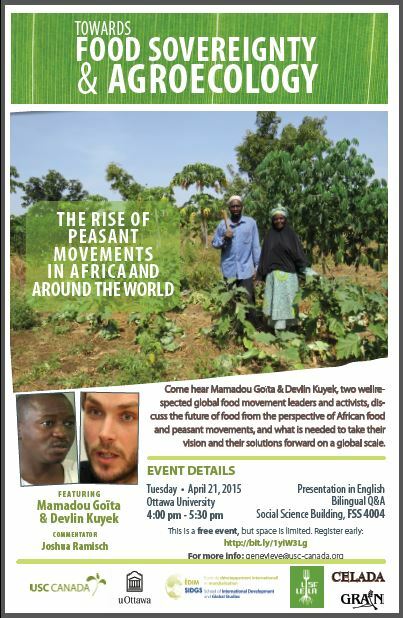 This event will be put on by USC Canada, the University of Ottawa’s School of International Development and Global Studies (SIDGS), the Laboratory for the Interdisciplinary Study of Food (LISF-LEILA), GRAIN and CELADA. 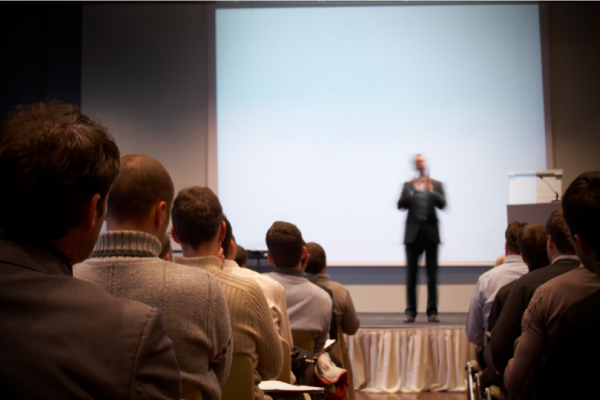 Join us for our Panel Presentation – Tuesday, March 24th, 2015! We would like to thank the Canadian International Council for publishing an opinion piece written by CELADA’s executive team on their International Affairs blog. 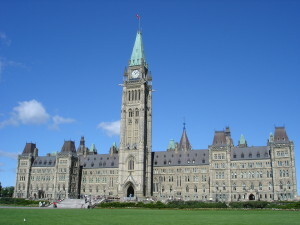 In this piece CELADA seeks to challenge the Canadian government’s current stance on Free, Prior and Informed Consent (FPIC) — mainly their unwillingness to support international legislation that incorporates FPIC language — and to highlight how this has impacted the land rights of marginalized populations around the world, most significantly in Africa. It is our hope that this piece inspires Canadians to reflect, to debate, and to question our government’s reprehensible policy on this human rights issue. 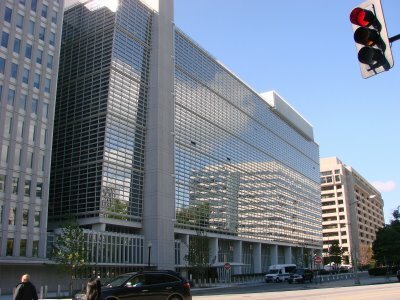 CELADA was recently notified by the Managing Director of Inclusive Development International that the World Bank has presented to its Board a draft of its new social and environmental safeguards policies. Inclusive Development International and other organizations have reviewed a leaked draft of these policies and are appalled by its implications. Based on the evidence available, CELADA is equally concerned. An ‘opt out’ option for governments that decide they don’t want to apply the Indigenous People’s policy. Major dilutions of the Bank’s current standards on “involuntary resettlement,” including the requirement for borrowers to submit and the Bank to review and approve – prior to project approval – a comprehensive resettlement plan that ensures affected people are not harmed and have an opportunity to share in the benefits of the project. Exclusion of land titling projects from the coverage of the resettlement policy, leaving people like Cambodia’s Boeung Kak Lake community whose homes were demolished after they were determined not to have ownership rights by a Bank titling project completely unprotected from forced eviction. Totally inadequate protections against land-grabbing, despite an alarming reference indicating that Bank projects could involve large-scale transfers of land for agricultural investment. We have added CELADA’s name to a statement that will be sent to The Board Committee on Development Effectiveness (CODE) Monday morning with the message that this draft is a non-starter for consultation and must be sent back for major revisions. Depuis 2011, la Coalition pour la Protection du Patrimoine Génétique Africain (COPAGEN) en partenariat avec le Centre de recherche sur le développement international (CRDI), Inter Pares et REDTAC,  ont mené un projet de Recherche participative sur les acquisitions massives de terres agricoles en Afrique de l’Ouest. Les résultats de cette recherche ont fait l’objet d’une tournée au Canada au début du mois d’avril 2014, et plus spécifiquement, une table ronde organisée le 4 avril 2014 à Ottawa. Cette rencontre a été particulièrement intéressé CELADA en lui donnant une perspective précise et actuelle du problème d’acquisition des terres dans cette partie de l’Afrique. Les membres de CELADA accueillent favorablement les résultats de cette recherche qui viendra alimenter la poursuite de ses activités visant à sensibiliser l’opinion publique au Canada sur les questions d’accaparement des terres en Afrique. CELADA is happy to announce that our roundtable on African land grabs, held on parliament hill on Feb. 25, 2014, was a resounding success thanks to the assistance of Hélène Laverdière, Member of Parliament for Laurier-Ste.Marie and official opposition critic for international development. With roughly 50 people in attendance, the event brought together Members of Parliament, academics, researchers and members of the development NGO community. The forum allowed these attendees to engage and debate with our speakers, who included Robert Fox, Executive Director of Oxfam Canada; Obang Metho, Executive Director of Solidarity Movement for the New Ethiopia; and Maggy Razafimbahiny, member of CELADA and development activist (biographies available here). The discussion generated a number of ideas and suggestions to tackle the rising tide of land-grabs resulting in involuntary displacement of customary inhabitants in Africa and other developing countries. One proposal that CELADA is currently pursuing as a follow up to this event is to encourage the House Committee on Foreign Affairs and International Development to hold a hearing to consider the views and recommendations of experts and, if possible, local residents from countries dealing with land grabs. Land-Grabs Expropriate Poor Farmers’ Livelihoods – a guest blog on the McLeod Group Blog written by CELADA’s Chair, Roy Culpeper. Roundtable Outcomes Document – provides more details on the roundtable event discussed above. As discussed in a previous post on October 30th, CELADA had the opportunity to meet with Hélène Laverdière, the Official Opposition Critic for International Cooperation and the Deputy Critic for Foreign Affairs. In discussing CELADA’s mandate and our mission to build awareness around the issue of land grabs in Africa, she proposed an event for MPs that would do just that. 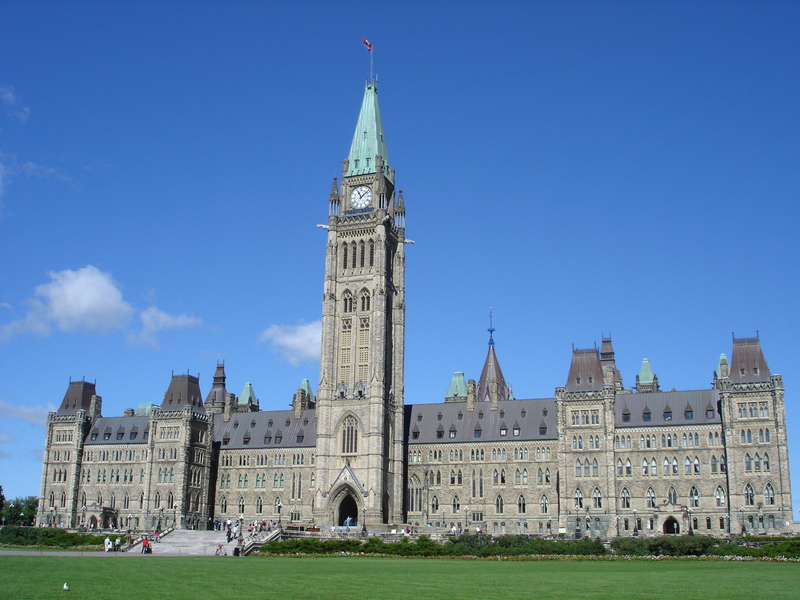 As such, CELADA is pleased to announce that we will be hosting and event on Parliament Hill on February 25th, 2014. We will have the honour of doing so in partnership with Oxfam Canada and the Group of 78, and have an excellent group of speakers lined up. 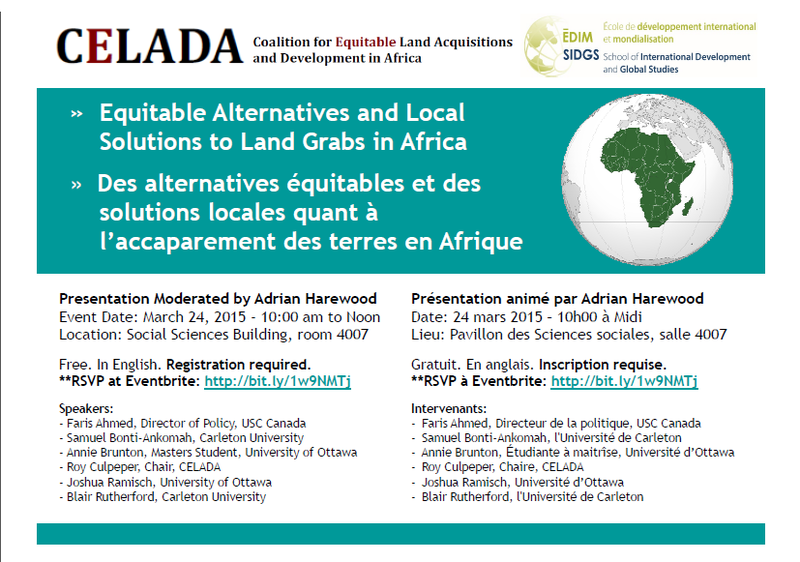 It is our hope is that the presentations and discussions at this event will build awareness and contribute to the dialogue on Canada’s role in tackling the issue of land grabs in Africa. In addition to MPs and their staff, we will be inviting civil society and private sector actors who have played or will play an important role in the land grab debate within Canada. In light of this, please contact us if you know of someone who would like to contribute to the discussion as an attendee. OTTAWA – CELADA is pleased to announce that a small subgroup of its members had the opportunity to meet with Hélène Laverdière, the Official Opposition Critic for International Cooperation and the Deputy Critic for Foreign Affairs. In this meeting, held on Oct. 22nd, 2013, they were able to draw attention to the issue of land grabs, its impacts in the African context and the CELADA mandate. Our members were particularly interested in highlighting the fact that Canada is relatively behind with respect to its Western counterparts when it comes to supporting some of the global initiatives to end land grabs. As such, Mme Laverdière was able to propose various options for action which CELADA will be pursuing in order to challenge this inertia and spur the current government into action. Stay tuned for more updates on what these options for action will entail! On October 2nd, 2013 Oxfam International published a press release which highlighted the release of their new report, Sugar Rush: Land rights and the supply chains of the biggest food and beverage companies. In the report, Coca-Cola, PepsiCo and Associated British Foods (ABF) stand accused of intensifying the rush for land (in Africa specifically but also worldwide) through their increasing demand for sugar. In light of this situation, Oxfam is asking these three companies to understand and build awareness around the risks related to land issues, commit to zero tolerance for land grabs, offer full disclosure and transparency with respect to their sugar supply chains, lobby governments and corporations for improvements on land issues, and support equitable agricultural investments. Our website now offers some new pages for people who are interested in contributing to the CELADA cause, but who are not quite sure where to begin.